One of the few accommodation choices where everything is accessible on foot. No steep hills to climb on your way back from the dining on the waterfront. You can leave your car at the front door. 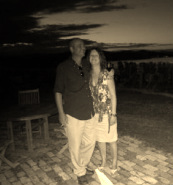 Steve & Emma Jury - Steve originally from The Bay and Emma originally from the UK have owned the house since 2001. Presently we are working overseas, however were leaving you in very capable hands. Didee will be with you for your check in & point of contact during your stay should you require any further help with the house.